The genetic diversity of Africa's indigenous livestock needs to be tapped before it is lost forever, researchers have warned. They said native breeds had adapted to tolerate parasites or produce "robust" milk yields in harsh conditions. Writing in the journal science, they added that these traits had yet to be unlocked by the scientific community. But indigenous breeds were dying out as farmers switched to "exotic" cattle from developed nations, they observed. 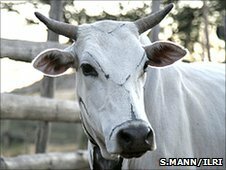 "African cattle are just another species of ruminants in a landscape already full of ruminants, and they have adapted to this environment," explained co-author Olivier Hanotte from the University of Nottingham's Institute of Genetics. "But rather than unlocking the genetic secrets of these breeds and using what is already there, there is a tendency within sub-Saharan Africa to move across to the highly developed breeds from Europe." However, the vast majority of "exotic" breeds from Europe were ill-suited to cope with the conditions found in Africa, he added. Professor Hanotte said one reason was that they were bred to maximise productivity. "The only way they can survive is if you completely change the production system as well and mimic the systems used in Europe," he told BBC News. One of the consequences of switching to a European style of farming was that it increased the likelihood of diverting valuable food crops away from human consumption in order to feed the novel livestock. "In my opinion, this is probably the worst thing that you could do," he warned. Professor Hanotte suggested that some of the adaptations found in sub-Saharan Africa livestock could be of interest to the global agricultural sector. "This is a very important point," he said. "We have lost, for example, many adaptation traits in European livestock, but it may still be present in Africa. "A typical example is resistance to gastro-intestinal parasites in small ruminants. This is a world-wide issue that has an economic impact in sheep farming. "There are a number of ways that you can tackle this, one of which is to use drugs, but some African breeds are actually resistant to these parasites." He said that indigenous cattle had also adapted over the centuries to cope with a hot, dry climate. "What we should actually be doing is acknowledging that the (indigenous) animals are living, producing and reproducing. "And they can provide the genetic material, if we are willing to invest in the genomic tools, to improve the breeds in a sustainable way." However, genomic research in agriculture was concentrated in the developed world, he observed. "So this - combined with lack of technical capability and funding in Africa - has led to the lack of research into the continent's indigenous livestock. "Yet in Europe, we have lost a great majority of livestock's genetic source. "So the reason why we should tap African livestock genomes is not only for Africa, it is for everyone."